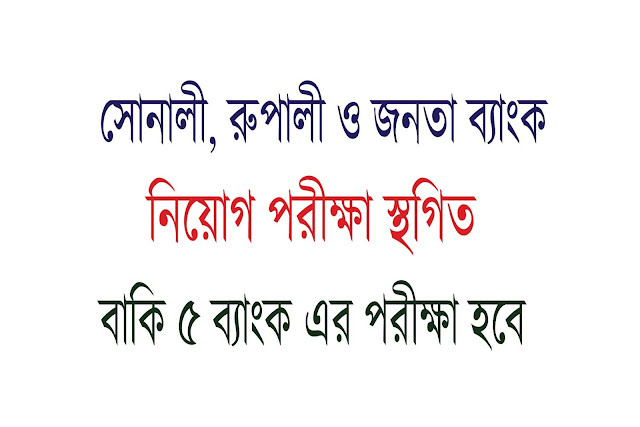 The High Court of Bangladesh has postponed the recruitment process examination for the position of senior officer, officer and cash officer of state-owned Sonali, Rupali and Janata Bank. As a result, the recruitment exam for those three banks scheduled for January 12 will be postponed. But, other 5 Banks exam will be held as well. The High Court bench of Justice Mainul Islam Chowdhury and Justice JBM Hasan gave the order on Sunday for hearing on a writ petition challenging the recruitment notice of eight state-owned banks. Advocate Rashidul Haque Khokan hearing on behalf of the writ petitioner; Along with Advocate Tanjim Al Islam and Mirza Sultan Al Raja Deputy Attorney General Mohatar Hossain Saju was present in the state. Rashedul Huq Khokan told us that the court directed that the recruitment tests of Sonali, Rupali and Janata Bank were to be examined under three recruitment notices in the last year.